Pulitzer-Prize winning poet Gwendolyn Brooks is one of the great American literary icons of the twentieth century, a protégé of Langston Hughes and mentor to a generation of poets, including Sonia Sanchez, Nikki Giovanni, and Elizabeth Alexander. Over the next sixty years, Brooks’s poetry served as witness to the stark realities of urban life: the evils of lynching, the murders of Emmett Till and Malcolm X, the revolutionary effects of the civil rights movement, and the burgeoning power of the Black Arts Movement. Critical acclaim and the distinction in 1950 as the first black person ever awarded a Pulitzer Prize helped solidify Brooks as a unique and powerful voice. 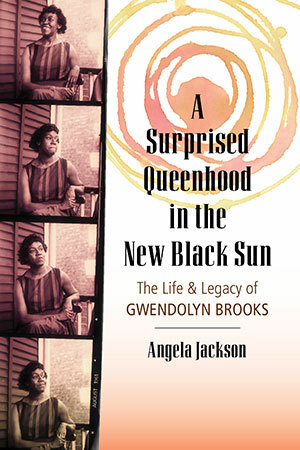 Now, in A Surprised Queenhood in the New Black Sun, fellow Chicagoan and award-winning writer Angela Jackson delves deep into the rich fabric of Brooks’s work and world. Granted unprecedented access to Brooks’s family, personal papers, and writing community, Jackson traces the literary arc of this artist’s long career and gives context for the world in which Brooks wrote and published her work. It is a powerfully intimate look at a once-in-a-lifetime talent up close, using forty-three of Brooks’s most soul-stirring poems as a guide. From trying to fit in at school (“Forgive and Forget”), to loving her physical self (“To Those of My Sisters Who Kept Their Naturals”), to marriage and motherhood (“Maud Martha”), to young men on her block (“We Real Cool”), to breaking history (“Medgar Evers”), to newfound acceptance from her community and her elevation to a “surprising queenhood” (“The Wall”), Brooks lived life through her work. Jackson deftly unpacks it all for both longtime admirers of Brooks and newcomers curious about her interior life. A Surprised Queenhood in the New Black Sun is a commemoration of a writer who negotiated black womanhood and incomparable brilliance with a changing, restless world—an artistic maverick way ahead of her time.